No living creature, they are dead or alive is able to tell us the exact origin of the chief divinity ORISAALA or OBATALA. There are several conflicting stories surrounding the mystery of this divinity. GOD created the positive and dynamic powers of the heavens, known as IRUNMOLES (the great and extremely positive divinities) led by the personality of OBATALA. 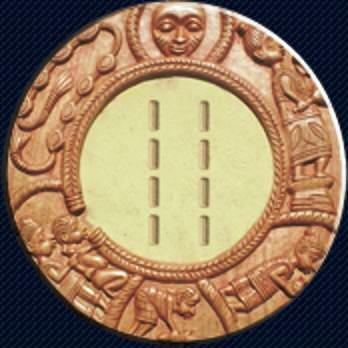 These divinities include IFA ORUNMILA BABA AGBONMIREGUN, OGUN, SANGO, ESU, ORO, YEMOWO and many others. In the same fashion OLODUMARE formed in the beginning of creation (IWASE) the alternatives of the positive and dynamic powers – negative spiritual vibrations called AJOGUN ORUN – THE PUNITIVE KNIGHTS OF HEAVEN. Traditions reveals that it was ORISAALA who was the mother of Obanla and Obalufon, both of them were men. ORISAALA had other children, amongst them Yemoja. Yemoja gave birth to Osun – the grand-daughter of ORISAALA. Orisanla or Orisa ala had another daughter called EFUNSEEKE. Efunseeke came of age and married. One day Ogun was celebrating one of his annual festivals in which he was drunk and as a consequence of a joke wine and alcohol entered the eyes of EFUNSEEKE and she became blind. Orisaala went to consult IFA to know why such a horrific event happened to her daughter. Orunmila made the divination and the odu OGUNDA IGARA appeared. Orunmila bowed down and knocked his head on the ground three times for IFA saying ABORU ABOYE meaning, ‘obeisance to you oh divinity’- and while his devotees who were with him responded ‘a agbo a a to’ meaning: “we will live long , with wisdom and understanding”. Orunmila asked Orisaala: IRU IGARA WO LO FE DA ALANIYAN YI OO, meaning: ‘what kind of challenges is facing the owner of this odu? ORISAALA replied and told IFA how OGUN poured gin in the eyes of her daughter EFUNSEEKE and how Eefunseeke went blind. This was the challenges they were facing right now. Orunmila instructed Orisaala according to the odu to bring five snails as a sacrifice. The blood water from the snail would be used to cure the blindness of Eefunseeke. (Water from the snail is called OMI- ERO). Orunmila instructed Obatala to drop little by little OMI ERO into the eyes of her daughter until she would regain her sight. OBATALA (Orisaala) did all what was expected of him and followed the advice of IFA and indeed Eefuseeke regained her sight. From that moment, gin or alcohol became a taboo for all the worshippers of ORISAALA, OGUN and IFA to ensure a sound mental state, a good spiritual state and physical fitness during worship and day to day activities. OBATALA, IFA and OGUN worshippers should refrain from drinking alcohol, smoking, behaving contrary to what is godly. They should also be moderate with consuming salt, sugar and oil – if not completely abstain from it – at least keep it to a minimum. In the case of salt, sugar and oil – they are taboo to all worshippers of OBATALA. Albinos are natural prophets from GOD, sent here to direct our spiritual steps. The second school of thought believed that OBATALA was a male deity, one of the greatest powers – a leading figure who led other divinities from the heaven above to the physical plain of existence. It was believed that ORISALA was the only divinity given a place at the right hand side of OLODUMARE in his majestic kingdom – ENI OTUN ELEDUA. White cloths are the symbol of his presence and should be worn frequently by his worshippers. Melon soup (obe egusi) is forbidden during OBATALA ceremony and Corn should not cooked during the week of rituals for Obatala (a ko gbo do se ase ti o ni agbado lojo ose obatala). OBATALA was the first divinity and he chose the first day of the week as his own day of worship. He is believed to be the real image of GOD and true representative of GOD in the world. DID YOU NOT KNOW THAT OBATALA WILL NOT GIVE OUT HIS CHILDREN WITHOUT A COST? After the IFA priest had chanted the IFA verse he instructed ONIYAGBE that on getting to his farm the day after he should hide himself to witness a strange phenomenon at his farm. Whatever happened he was told to inform the Ifa priest of so he could be able to prescribe the necessary sacrifice to overcome the evil establishment. When the owner of the farm heard this he got furious. He pulled out his gun and shot the female ape and killed her. ONIYAGBE later opened the bowel of the female monkey and removed the placenta in her womb. He encountered another phenomenon in her womb called SESEFUN. He took the SESEFUN to the IFA priest. On getting to the house of the priest, there was another round of divination in which he was told that his prayer had been answered and his wife would conceive and he would need to do another set of sacrifices. ONIYAGBE was asked to bring a plain white cloth to be tied to PEREGUN TREE (DRACAENA FRANGRANS OR DRACAENA ARBOREA). He should place a pot under this tree and always pour water on the tree and the water would be dropped into the pot. The chief priest told the wife that the water in the pot should be the water to be taken every morning (both for drinking and for bathing) and the SESEFUN the husband found in the womb of the female ape must be kept inside the pot with the water. The wife of Oniyagbe did all the rituals according to the instruction of the Babalawo and in a short time she conceived and gave birth to a beautiful child. She bathed the baby with the spiritual water in the pot as instructed by the IFA priest while the cloth wrapped on the PEREGUN tree was the only clothing used by the baby. In reality, when a child use such spiritual water and divine cloth, the child will be called the child of OBATALA because the materials are the emblem of ORISAALA ALASO FUNFUN – white cloth, SESEFUN – these children are given names like ABIAPE, that is , they have come with divine names which is derived from divinity and thus informs their destiny. The above IFA myth teaches us two important things. The first important thing is the importance of learning to speak good about one self and also about others. One should avoid speaking evil, no matter how grave our challenges or evil circumstances might be so that we will not be attracted to greater evils and thus bring into motion greater calamities from our utterances and from our mind. IFA says that good words and good minds draw spiritual and physical sympathy and love while a strong word or evil utterance are like weapons. Good and kind words according to IFA can serve as a mechanism for progress, long life, and happiness, whereas, a mean word or evil utterance can attract strong negative consequences. The second important lesson is the act of conforming to spiritual guidance, to be able to achieve certain physical, mental and spiritual objectives, that is, one should adhere to spiritual instructions to fulfill one`s destiny . Irete meji speaks of ILE (the mother earth) as the element of worship in the cult of OGBONI and ILE is seen as the most important and dominant force in creation. She secures all the living and the non living creatures of the OMNIPOTENT GOD – OLODUMARE. IFA tells us that ILE (earth) consulted the oracle of IFA asking how she would profit from men’s undertakings and blessings in life. IFA instructed ILE to offer a sacrifice of 16 OBI, 16 OROGBO, 16 ATARE, 16 RATS, 16 PIGEONS, and 16 GUINE FOWLS AND 16 BAGS OF COWRIES. Irete meji says the Ogboni Society was founded to secure the worship of mother – earth. This forms the central part of all the ceremonies of the society. The proper time for propitiating the earth and ensuring its fertility is after all the necessary ceremonies were done and all rituals are carried out. The reply would come ‘’offer a bush rat’’. Acting on this recommendation ORUNMILA would receive good auspices for the city and all would turn out well, but as time went on things changed. When the Omnipotent indicated the sacrifice of a goat, these messengers reported to ORUNMILA that a Lamb should be offered. The sacrifice would result in failure. What could be responsible for this turn of events wondered Orunmila. Eventually the truth came out but ORUNMILA said nothing, he merely stopped the messengers from bearing further request to the OMNIPOTENT. One day ORUNMILA seized the messengers and killed them. The people of IFE wondered how ORUNMILA could do such an evil thing, killing his messengers who were always bringing good tidings to the people of IFE. The answer given to them by ORUNMILA was not satisfying, and the people decided to attack ORUNMILA, and without mincing words ORUNMILA hid himself from the anger of the people. They beat one of the disciples of ORUNMILA called IMULEGBE and AKALE – ORUNMILA`s guest was not spared. Orunmila later travelled to the forest with his friends until they got to a place called ‘’THE MIDDLE OF NOWHERE’’ and here they built three hut’s, one for AKALE – ESU, one for IMULEGBE – OBATALA, and one for ORUNMILA. Soon, there was a report from IFE that the city was under heavy plague and many problems. Fishes were dying in the river, sickness and illness became the order of the day. The pregnant women would no longer find it easy to have their children, men became infertile and the barren could not conceive. There was total chaos and pandemonium and nobody in the city was able to find a solution to the problem. The chiefs of IFE went out of their domain to seek solution but all to no avail. One day they met a diviner named CRAB THAT CRAWLS IN HOLES IN THE MARSH AWAY FROM WATER HABITANTS, but he declined to divine for them because of what ORUNMILA the chief diviner had said. He then instructed the people of IFE to look for ORUNMILA so that they might find solutions to their problems. They replied that ORUNMILA could not be found, and he said they should look for an antelope and bring him the animal so that he would help them look for another diviner. They brought the animal and were led to another diviner called GOLDEN –HUED LIKE FRESH PALM OIL who was expected to take them to where ORUNMILA resided. The diviner then asked the people of IFE to look for an antelope for sacrifice like was given to the first diviner. This request was more laborious than that of the first diviner, but since they did not have alternatives, they prepared to go into the deep bush and look for an antelope. They found an antelope which they pursued up hill and chased the animal into the forest until the people of IFE found themselves in the MIDDLE OF NOWHERE. Here, suddenly the antelope disappeared and they continued searching for the disappeared antelope until they found the three huts built for ORUNMILA, AKALE and IMULEGBE (ORUNMILA, ESU AND OBATALA). The people of IFE could not believe that a sane man could live in this remote area, but to confirm their doubt and curiosity, they threw a stone at one of the huts and immediately ESU – AKALE, came out in annoyance asking them who threw the stone. They actually saw that it was ESU, and ESU asked them what was the problem with them and why they needed to find them here in the deep forest. They pleaded with ESU and told him the predicaments that were currently haunting them at IFE. ESU listened to them and asked them to go and look for some sacrificial materials if they wanted any solution to their problems. The materials they needed to get was 2 BUSH –RATS, 2 DRIED FISH, 2 OBI, 2 OROGBO, 2 ATARE and several other things in pairs. They returned to IFE in order to secure the materials. They told about their experiences to the king and the king advised them to take all the materials and that they should try to find ORUNMILA himself. Immediately after they left ESU reported how the citizen of IFE came and stoned his hut to ORUNMILA and how he came out to question them and how he instructed them to look for some sacrificial materials so that their predicaments could be solved. Then ESU asked ORUNMILA how he could help them if they returned. ORUNMILA told ESU to go to the hut of OBATALA to report the case to him exactly as he had told to ORUNMILA. ORUNMILA pleaded to OBATALA – IMULEGBE that OBAORISA would listen to ESU – AKALE and the story of the disasters in IFE. If nothing was done there could be even more severe situations unfolding. OBATALA, in the first instance did not comply with ORUNMILA`s plea and despite numerous attempts, OBATALA did not give in to their plea. Then ORUNMILA chose and used stronger, wise and mystic language before ORISAALA heeded to the plea, and what was this language? When the people of IFE returned with the sacrificial materials, ORUNMILA forgave them, ORISAALA forgave them and ESU also forgave them. With the materials a sacrifice of atonement was performed and the three divinities and the people of IFE returned to the city of IFE with dance and song, rejoicing that their city and the people had been saved from calamity. From that time on the city of IFE spread in all directions until it touched every corner of the world. The rating between ORUNMILA and OBATALA is extremely difficult to analyze, but since the junior should first seek the favor of the senior and in the beginning of the myth we see that OBATALA was the senior, being sought after by ORUNMILA. But if we go by the power of words, and the significance of what words and its beauty could do, one would wonder that a good word could give us a leadership role. The power of forgiveness too should not be seen as an ordinary power – it is one of the strongest vibratory power in the universe and if we go by the last phrase of the concluding part of ORUNMILA`S pleading statement, it shows that ORUNMILA forgave them, OBATALA forgave them and ESU forgave them. Obatala is next to GOD in order of importance. He takes precedence over all divinities. GOD endowed Obatala with the responsibilities of creating all creatures. He made the head, nose, eyes, mouth, skull, while OLODUMARE placed within man the breath of life which is the spirit and the soul that make man a living being. He is the maker of the image of man from clay and place man in the uterus of a woman. Woman seeking the blessing of children must constantly give obeisance to OBATALA for a sound, perfect and whole child free of deformities and any blemish whatsoever. Deformed and blemished children like albinos are dedicated to him and takes a special prominence in relation to Obatala. ODUDUWA is known as IYA AGBE, ‘the mother of the gourd’ or ‘mother of calabash’. She is represented by a woman nursing a child in a sitting position. Going by name ODUDU WA that is ODU TO DA IWA, which means the vibration that creates IWA. IWA according to Yoruba is ‘character’, ‘being’, ‘life’, ‘destiny’, and ‘heaven’ (like in the phrase ‘o losi iwa ORISA’ meaning; he has departed to the land of ancestors or divinities). Iwa here becomes a word on which the word ODUDUWA is patterned upon. Consequently He or She may be the father or the mother of all beings, but those who see ODUDUWA as the wife of Obatala did not miss the way – actually they reinforced the position of ODUDUWA as a divinity or deity of immense importance in creation. We should not forget that the original IGBA IWA, The Calabash of Character, was given to OBATALA. Orunmila helped him to carry IGBA IWA from IWARUN to the ISALU AYE where the IGBA IWA was snatched from him by ORO and retrieved by ESU and returned to Obatala through patience and extreme spiritual wisdom. This was all OBATALA needed to endure and pass through challenges that transformed him into the greatest divinity of all. GOD gave to OBATALA the secret to attract the blessing of wealth, prosperity, long life, happiness and strength – which he gave to his followers and other faithful followers of OLODUMARE.